Marine Fighter Attack Squadron (VMFA) 232, Marine Aircraft Group 11, 3rd Marine Aircraft Wing fly F/A-18C Hornet airplanes during deployment for training on Tyndall Air Force Base, Fla., May 13, 2013. US Marine Corps photo. 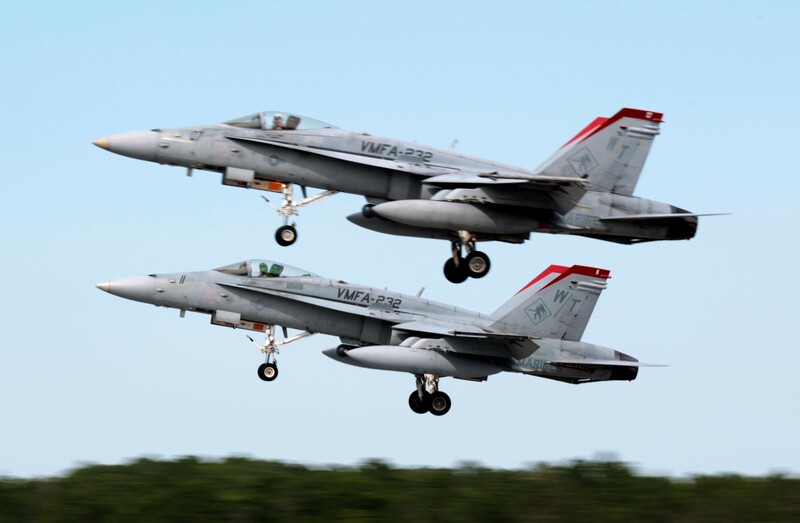 The Marine Corps ordered a mandatory 24-hour operational pause for all non-deployed units to focus on safety and readiness issues following three F/A-18C Hornet crashes this summer, two of which were fatal. Deputy Commandant for Aviation Lt. Gen. Jon Davis ordered all Marine Aircraft Wings to take a one-day break in operations within the next seven business days to allow leaders “to align, discuss best practices and to look at ways to continue to improve,” spokeswoman Capt. Sarah Burns told USNI News. Each MAW is required to hold two operational pauses a year, with this directive coming on top of the existing requirement to address concerns about force readiness. Maj. Richard Norton, a pilot with Marine Fighter Attack Squadron (VMFA) 232, died July 28 when his Hornet crashed near Marine Air Ground Combat Center Twentynine Palms in California during a training mission. Five days later, a Navy pilot flying a Hornet from that same squadron crashed into an open field near Naval Air Station Fallon, Nev., and safely ejected. Both incidents are under investigation, Burns said. Earlier in the summer, Blue Angels pilot Capt. Jeff Kuss died when his Hornet crashed during a training run ahead of an air show in Tennessee. And last fall, another VMFA 232 pilot, Maj. Taj Sareen, was killed in a Hornet crash in Great Britain while returning home from a deployment to the Middle East as part of Operation Inherent Resolve. The Marine Corps has not discussed any commonalities between these four incidents, with Burns saying that each is unique in its circumstances and noting that the latest crashes remain under investigation. The operational pause will let each MAW commander take a hard look at that unit’s state of readiness and report up to Davis, who would determine any follow-on actions. The Marine Corps Times first reported on the operational pause yesterday. Davis told reporters on July 29 that non-deployed units were training enough to be safe while flying but not enough to be proficient in skills they may need while deployed, with a final proficiency push coming during pre-deployment training. The service has struggled to keep enough of its jets and helicopters ready to support training for units at home. Today only 85 Hornets are flyable and available for training, compared to a requirement for 171, Burns said. Still, that figure is better than it was before – since Davis launched a readiness initiative in December 2014, the service has 14 percent more ready aircraft at home, she said. The Marine Corps is on track to reach full readiness recovery in 2020, as long as sufficient money and resources remain available for parts, maintenance work and training.